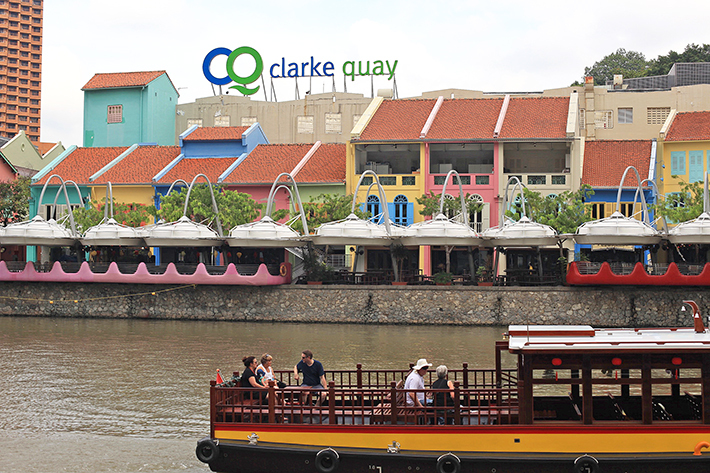 Clarke Quay is a food paradise – with over 20 lunch offerings & options - and offers a great range of wallet-friendly brunch options that are no less satisfying. That’s not all. Drivers also get to enjoy free parking* on Sundays from now to 24 Jan 2016! From now to 24 Jan 2016, Sundays are made more fun with Sunday Sports Carnival at Clarke Quay; look forward to a series of fun-filled bonding activities such as lawn darts, giant and many more bowling, along with the opportunity to win prizes such as a Novotel Singapore Clarke Quay staycation and Dining Vouchers worth up to $1000!. From famous joint, The Butchers Club Burger to Balinese restaurant Bayang, here are 9 Exciting Brunch Destinations at Clarke Quay that you should check out this weekend. Selected restaurants are extending kids-dine-free offers and 1-for-1 promotions! Are we in Bali? That was the first thing that came to our minds when we entered Bayang. The authentic spread of Balinese dishes sure means comfort food. Our favourites are Soto Ayam Madura Soup (S$16) and Sate Campur (S$14). The former is a chicken soup with glass noodles, shredded chicken and boiled egg, while the latter comprises six skewers of assorted meat. Then, there is the refreshing ice-cold Cendol Dessert (S$6) – green jelly, red beans topped with coconut cream, palm sugar and crushed ice. Patrons are also entitled to 1-for-1 Tiger Beer from 12pm – 3pm on weekends. Fish and Chips lovers will appreciate CATCH Beer & Batter. Their bestselling Dory Fish and Chips English Ale Batter (S$24.50) are served with fries at an unbelievable 1-for-1 promotion on weekends from 12pm – 3pm. Otherwise, pasta options include the Seafood Linguine Aglio Olio (S$18.50). The Catch Seafood Platter of Ale Battered Fresh Prawns, Calamari Rings, Fish Fingers, Cajun Fries, and Coleslaw with three different dipping sauces is just the perfect sharing platter – all these seafood goodness at only S$36.50. Lemonades to love are the Strawberry Mint Red Summer and Honey Lemon Mint White Summer (S$8.90 each). Harry’s has been around for over 2 decades and is still the go-to destination for drinks. They introduced a new food menu this year, and we were so impressed by the Harry’s Signature Wings (S$13 – six pieces, S$19 – ten pieces), Charcoal & Onion Ciabatta (S$14), Fish Cracklings (S$13) and Crab & Potato Cakes (S$19). Everything tastes better when paired with a pint of drinks. Beer fans, listen up. The Harry’s Premium Lager (S$13) is a quality light and hoppy brew that will definitely satisfy. If you are after something stronger, try Harry’s 1992 (S$16), which is a bright-blue coloured vodka-based concoction with lychee liquor and grapefruit juice. Gone are the days where you can actually find a filling restaurant meal under the price of S$10++, but Hooters has made it a point to keep its lunch set extremely affordable. Diners can expect a main course, soft drink and an ice-cream at only S$10++! There are 10 main courses to choose from, such as Hooters Wings with Fries, Hooters Beef Burger, Honey Mustard Chicken and Chicken Pesto Pasta. This amazing deal is valid daily from 11am – 3pm. Diners can also top up S$2.50++ for a soup of the day and a coffee/tea, or top up S$5++ for a mug of Tiger Beer. That aside, we suggest you try their signature Hooters Wings (S$14.90++ for ten pieces). From Samurai Sweet Teriyaki to Spiciest Level 911, there is a range of spiciness you can choose from. Named after the ancient alleyways of China’s capital, Hutong is a Northern Chinese restaurant specialising in age-old traditional recipes. The interiors of the restaurant feature large hanging red lanterns and antique-looking furniture- the ideal venue to have a business luncheon at, or a meal with your family and friends. Two particular dishes were notably outstanding – the Crispy Chicken in Szechuan Style with Dried Chilli (S$16) and Crispy Bbq Garlic Pork in Hutong Style (S$26). The barbecue pork dish is eaten in a Peking duck style, where you fill pancake pieces with cucumber, spring onions along with the meat. Guests get to enjoy 1-for-1 Tiger Beer over the weekends from 12pm – 3pm. Little Saigon is no ordinary Vietnamese eatery. Regardless of the time you visit, there is always something in store for you. For a light brunch, you can get a banh mi sandwich (choose from Grilled Chicken, Fried Tofu or and Red Snapper). During Happy Hour from 4pm to 9pm daily, enjoy 50% OFF all cocktails, draft beers (Heineken/Tiger> and Wines by the Glass. It is definitely a sweet deal for the ladies to enjoy a drink while enjoying live music performances by modern acoustic bands. Ladies, go for the Miss Saigon (S$15.50++) – a lovely vodka concoction sweetened with cranberry juice and lychee syrup. For a stronger alcoholic beverage, get the gin-based Hanoi Martini (S$15.50++). McGettigan’s is the place to be and to be seen. The Modern Irish Pub offers sports fanatics the opportunity to support their favourite teams on live broadcast for various sports whilst savouring delectable bar nosh and beers. Besides live sports broadcast, the two-storey gastropub also offers a range of exciting promotions such as ladies night, happy hour, and quiz night. Dive straight for their sinful but very satisfying Gourmet Plank (S$40++), which features three hearty beef sliders, a pot of chicken wings, deep-fried calamari rings, garlic fries and pork belly popcorn. The Irish Burger (S$26++) is also a must-try – crispy pork belly marinated with cola, smoked streaky bacon and a runny egg are sandwiched between fluffy brioche buns. As part of Clarke Quay’s Sunday Fun Brunch Promotion, one child gets to dine for free with every 2 paying adults at McGettigan on every Sunday from now to 24 Jan 2016. 5-year-old Octapas Spanish Tapas Bar is one of our favourite destinations for Spanish cuisine. From small tapas plates to classic sangrias, diners are guaranteed a sassy Spanish experience. Appetisers to love include vegetarian Aubergine, Peppers, Onion with Parmesan Cheese Tostadas (S$10++) and Sauteed Mussels with Chorizo, Tomato and Sherry (S$16++). The beautiful Paella Valencia (S$41++) – served with chicken, chorizo, fish, mussels, shrimps and squid – stole the show. It is little wonder this is the most popular dish! And the Churros with Chocolate Sauce (S$10++) sure won our hearts. Also, Octapas has 1-for-1 promotion on draft beers, red/white sangrias, house pour wines, and spirits from opening till 8pm daily. The Butchers Club Burger in Hong Kong is where we frequent when we are in the city, and they are now here in Singapore too – right at Clarke Quay! The Butchers Club Burger is famous for their dry-aged beef patties and the ones served here are as scrumptious as its flagship’s. Bloomberg declared that as the ‘best burger’! Make a special trip over the weekend to savour their weekend-only Red-Eye Reduction Burger (S$28+) – a 160g dry-aged beef patty topped with cheddar, crispy hash brown, maple-glazed bacon and smeared with maple infused hollandaise stuffed between fluffy french toast buns. The Korean-inspired Wu Tang Style Burger (S$25+) will please those who have more Asian-skewed taste buds. The Butchers Club Burger is also one of the few restaurants in Singapore that does not have service charge. * Terms and conditions apply, check in-store or visit www.clarkequay.com.sg for the full list of Clarke Quay’s #SundayFunBrunch Promotion. This post is brought to you by Clarke Quay.